And why take a pill when you can have a nice cuppa tea? Published: May 30, 2011, 10 p.m., Last updated: May 31, 2011, 10:58 p.m. There's a massive market in unproven and dubious weight-loss supplements. Perhaps this is naive, but I expect large companies to be more responsible than small ones, at least when it comes to claims about their products. So I was surprised to find that Clicks pharmacies are not merely selling quack products (that I'm afraid is something all pharmacies do), they're branding quack products too. See the photograph above. The bottle contains 60 capsules composed of apple cider vinegar, vitamin B, green tea extract, ginseng, gotu kola powder, chromium polynicotinate and zinc. The label recommends two tablets daily, making this a month's supply. It costs R40. Since the branding makes a claim about the weight loss powers of apple cider and green tea, this article deals only with these products. Many people find green tea delicious. It's also nutritious and might even be good for you. It is popular in many parts of Asia where it is drunk regularly. Drink it and enjoy it by all means. But there is very little evidence that when combined with apple cider extract and turned into a pill it helps with weight loss. Cochrane Reviews: the gold standard for evidence in medical interventions. The Natural Medicines Comprehensive Database: a very useful, well-researched and soberly written guide to the medical effects of natural products (exactly what a natural product is, is open to some debate, but that's another story). 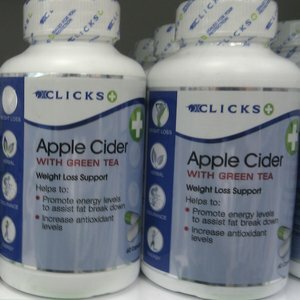 I checked these sources for evidence that green tea and/or apple cider, processed and rolled into a capsule as sold by Clicks, would help weight loss. There is a very early stage, as yet unfinished, Cochrane Review to determine the efficacy of Green tea for weight loss. A search on Pubmed for "green tea weight loss" finds 71 articles, most of them laboratory and animal studies. Clinical trial data is scarce and conflicting. But even only considering the most optimistic findings, if there is an effect on weight loss, it is small. The evidence, in a nutshell, is unconvincing. There is conflicting evidence about the effectiveness of green tea for obesity and weight loss. Preliminary clinical research shows that a specific green tea extract (AR25, Exolise) standardized to 25% epigallocatechin gallate (EGCG) reduces weight in moderately obese patients 8114. However, other clinical research shows that taking a green tea extract plus caffeine does not help maintain weight following a period of weight loss 14428. A meta-analysis of clinical studies suggests that, overall, taking green tea extract 576-714 mg/day along with caffeine seems to modestly reduce body mass index (BMI), body weight, and waist circumference compared to caffeine alone. But taking green tea extract without caffeine does not seem to significantly reduce weight or waist circumference 16892. So if there is any effect --and I stress there isn't enough evidence to say there is-- it seems caffeine is necessary. Yet, the R40 bottle from Clicks does not list caffeine as one of its ingredients. Moreover it recommends two pills a day. Each pill only contains 10mg of green tea powder, so the dose is way below possibly therapeutic amounts that are suggested by the Natural Medicine Comprehensive Database entry. Moreover it's unclear if the green tea extract in the Clicks product has been produced in the same way as the products in the studies. The other product branded in big letters on the bottle is apple cider. A search for "apple cider" in the Cochrane database turns up nothing. A search for "apple cider weight loss" on pubmed also returns nothing. The Natural Medicines Comprehensive Database entry does not find any evidence that apple cider vinegar is effective at anything. Though I must say, I find it delicious. So why take it as a pill? Drink it hot, preferably with some caramel in it. Enjoy, but don't expect to lose weight. The ASA has ruled previously against an advert made weight loss claims about apple cider. In our body-conscious and supposedly health-conscious society, being overweight is often socially stigmatising; and being obese is unequivocally unhealthy. But if there's one thing that millions of middle-class and poor people in South Africa share, it's the struggle against the bulge. The low price and allure of fast food and the numerous delicious goodies sold everywhere are often too tempting. And as you get older, it gets harder to keep your weight down. The proven safe and effective route to weight loss is to eat sensibly and exercise. It's hard and it's boring (see for example the free but austere eating plan inside the Clicks bottle) and many of us cannot do it. That's why there's a massive market in unproven and dubious quick-fix weight-loss supplements, which specialises in exchanging your money for false hope and ultimately frustration. It's disappointing that a large company like Clicks which should be concerned about its reputation for being truthful has jumped on this scam-wagon. This is not to say that green tea doesn't assist weight loss. We just don't know if it does because there isn't enough evidence. If and until that changes, companies should not claim green tea helps reduce weight. Thanks to Harris Steinman for assistance with this article. I take full responsibility for any errors.